The game has now gone beyond the 7DRL scope into a more full fledged development. The original 7DRL and the 7DRL++ versions have been archived for reviewing and historical purposes. 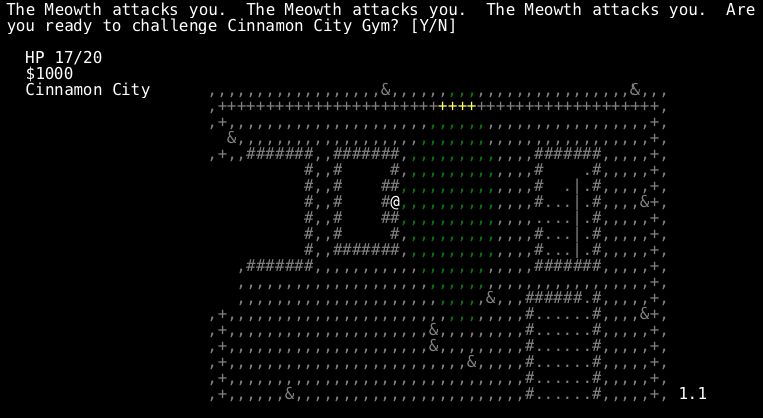 All advancement has been pushed to the github repo and is also available to play online here. Implementing the full generation one move-set is a lot of work! (ORLY?) I just managed to add the data for all 151 pokemon, their 165 moves and the 735 combinations of pokemon/move/level which represent the moves they can learn. I used data from all around the Internet for this, specially from Bulbapedia and this gamefaqs FAQ. I could have instead used the veekun pokedex database for this but was too lazy to set it up. 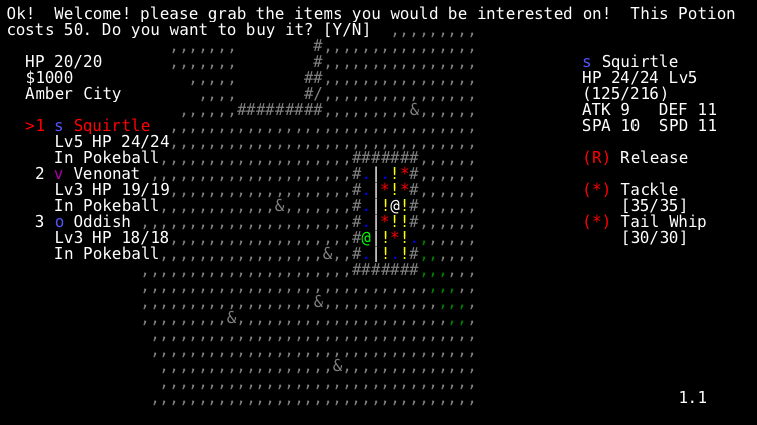 Seriously, still can’t understand why I overlooked this for the 7DRL planning. I should note that I’m restricting myself to Gen1 and even so, it’s not something to take lightly. I’ve done good advancement on implementing the moveset, initially focusing on the attack moves and their different parameters. So far there are 41 out of 165 moves covered. (There are a bit more which are partially covered). Some of the things to do in this regard are implementing Stat penalties and bonuses with the “stages” model, and implementing effects for the different status modifiers. Simulate pokemon trading somehow, since some require that for evolving. Make “Dig” let the pokemon actually go underground. Make “Fly” let the pokemon soar the skies. As for procedural generation, now that all pokemon are available I added some more route stereotypes (which should allow more varied wild pokemons to show up). I made these manually, using the wild pokemon spawn data from bulbapedia for the different routes. I decided to stop doing that and instead work in generating this higher level metadata mixing the pokemon data, route difficulty and biome/weather selected for each road, on a next release. I did some small tweaks on the town level generator to add a “fence” around them. I also modified the metadata generator so that the first town has a single exit to route 1, since people was getting stranded into high level routes and killed by deadly rattatas of death. This should make starting the game much easier.